The first time Curtis Blaydes stepped into the cage to face Francis Ngannou, he did so with little more than a jab and a double leg at his disposal. Sporting a 5-0 record and still putting himself through the paces at the local UFC gym a couple times a week, the former National Junior College Athletic Association national champion wrestler had risen to the highest level of mixed martial arts despite having little idea how to make the best use of his 6-4 frame, natural athleticism and acumen on the mat. He had steamrolled a series of regional fighters, but now he was standing inside the UFC Octagon, staring down a hyped prospect with prodigious power in Zagreb, Croatia, and he looked every bit the part of a green newcomer in dire need of coaching. All things considered, Blaydes acquitted himself quite well. He stunned the future title challenger with a right hand right out of the chute, recovered from a couple clubbing blows in the middle of the frame and put Ngannou on the canvas late in the frame. He put him back on the ground two minutes into the second round, landing in side control, but Ngannou was able to quickly scramble back to his feet. He continued working the jab and his conditioning looked to be on point, but his lack of defensive fundamentals and setups on his takedowns left him prone to eating power shots from Ngannou. By the end of the middle stanza, his right eye was swollen shut and the bout was halted. 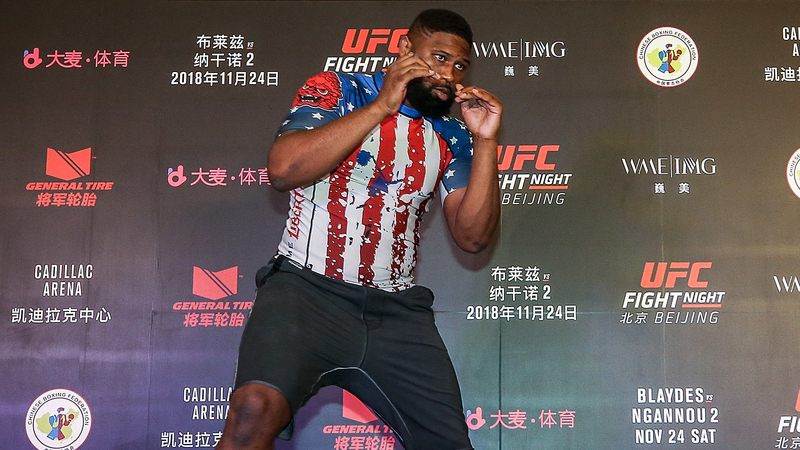 It was the first loss of Blaydes’ career and as he readies to share the cage with Ngannou for a second time this weekend in Beijing, China, it remains his lone defeat, yet this weekend’s main event showdown isn’t about revenge. Instead, it’s about continuing the impressive march toward title contention that began in earnest following that first encounter and showing everyone that as impressive as he has looked of late, Blaydes is still just getting started. Shortly after his loss in Croatia, Blaydes’ manager reached out to Leister Bowling to see if his client could venture down to Colorado to spend some time working with the Elevation Fight Team. When he arrived, a familiar face greeted the visiting heavyweight. The trio meshed right away and less than two months after facing Ngannou and just a handful of weeks after his one-week visit, Blaydes was packing his things and making the permanent move to Denver. His development since relocating and becoming a full-fledged member of the Elevation Fight Team has been nothing short of staggering. Blaydes carries a six-fight unbeaten streak into his second meeting with Ngannou this weekend in Beijing. Over the course of those six fights, the now 27-year-old heavyweight has gone from being a green prospect with obvious potential to a fighter on the brink of challenging for the heavyweight title. One of those victories — his win over Adam Milstead in February 2017 — was overturned and ruled a no contest by the Texas Department of Licensing and Regulation after an in-competition drug test revealed the presence of marijuana metabolites in Blaydes’ system. Earlier this year, the surging contender scored the two biggest wins of his career, first by venturing to Perth, Australia, and grinding out veteran knockout artist Mark Hunt and then by returning home and scoring a third-round stoppage win over heavyweight legend Alistair Overeem at UFC 225 in Chicago. As impressive as those performances were, it was the fight before his bout with Hunt that made Blaydes believe that he’s capable of ascending to the top of the heavyweight division. “I reached that point after my fight last November when I beat Aleksei Olienik,” he said of his UFC 217 encounter with the Russian veteran. Following stoppage victories over Cody East and Milstead, Blaydes struggled while collecting a unanimous decision win over Daniel Omielanczuk four months earlier in Las Vegas, pushing his unbeaten streak to three, but causing some to reconsider how highly they thought of the emerging heavyweight. Paired with Olienik in the second bout of the UFC’s second annual November trip to New York City, Blaydes had to battle against his wrestling instincts to avoid being stuck on the ground with the Russian submission expert for extended stretches. Instead, he focused on throwing hands, stinging Olienik with multiple big shots in the late stages of the opening round. Early in the second, Blaydes’s edge on the feet continued to widen as Olienik tired. Time was called just under two minutes into the second round when Blaydes grazed the side of Olienik’s head with an illegal kick. When the doctor checked on the 65-fight veteran, he was deemed unable to continue and the rising contender collected another victory. While all coaches are admittedly biased, Donovan can’t help but laugh when he discusses the growth Blaydes has exhibited since his first appearance in the Octagon until now and the kind of terrifying potential he sees in the emerging title threat. “Imagine if the first time you studied striking was after your first UFC fight. He got in there as green as a person could possibly be and still did pretty well,” Donovan said. While there is obviously a helping of hyperbole baked into his comments, Blaydes’ two performances earlier this year underscore the growth, development and devastating power that Donovan speaks of. Against Hunt, Blaydes was able to absorb several big shots early and rally to put the prolific knockout artist on the mat repeatedly en route to a clean sweep of the scorecards, but it was his fight with Overeem that really opened people’s eyes. Just four months after venturing to Australia and grinding out “The Super Samoan,” Blaydes returned home to Chicago and sent the crowd at the United Center into hysterics by following a similar blueprint against the former title challenger and decorated striker while showing off a new wrinkle to his game. After taking some solid shots from the powerful veteran and controlling him on the canvas at various points through the opening two rounds, Blaydes stung Overeem with strikes in the opening minute of the third before putting him on the canvas and unleashing a series of hellacious elbows from top position that split the veteran open and brought the fight to a sudden halt. While many are framing this weekend’s main event as a grudge match and a chance for Blaydes to avenge his prior loss to Ngannou, the Chicagoland native doesn’t see it that way. “Everyone is making it emotional, but it’s not emotional,” said Blaydes, who declared earlier this month in Denver that he was willing to “go the Khabib route” and take out as many opponents as necessary in order to make his way to the UFC heavyweight title. As far as he’s concerned, Ngannou is just another man standing between him and the heavyweight strap. With his confidence at an all-time high and his skill set continuing to deepen and expand, Blaydes has no doubt that his journey to Beijing will result in a victory. More importantly, he recognizes the strides that he has made as a fighter since his first meeting with Ngannou — the changes to his approach, the developments in his game — and it has imbued him with the belief that not only will he be triumphant this weekend, but that he’s capable of beating whomever the UFC puts in front of him. As for Donovan, he believes that with a little more experience and a little more time, his charge could develop into the unstoppable juggernaut everyone anticipated former champion Cain Velasquez would become as he rose to the top of the heavyweight ranks.